SHIPS SAME DAY version- no customization including stain or engraving available. Stained Kona, ships same day if ordered before 2pm EST. We are proud to offer a premium version of a desktop or nightstand valet to hold your valuables by your side. These are NOT made by machine or cheap plywood; they are made by 100% natural wood by our two hands. Our valets are sourced, assembled, stained, and finished by our two hands. Our Valets are made from premium woods such as solid oak, walnut, zebra wood, cherry, or purple heart, and other quality woods. We can also provide locally reclaimed wood for special requests and depending on the species of wood chosen. For more on our process and materials, see the About Us page. The most unique part of this listing, it is for our left handed customers! The same item as for our right-handed customers just reversed. The phone is on the right and the watches are towards the left. Everything else is the same! 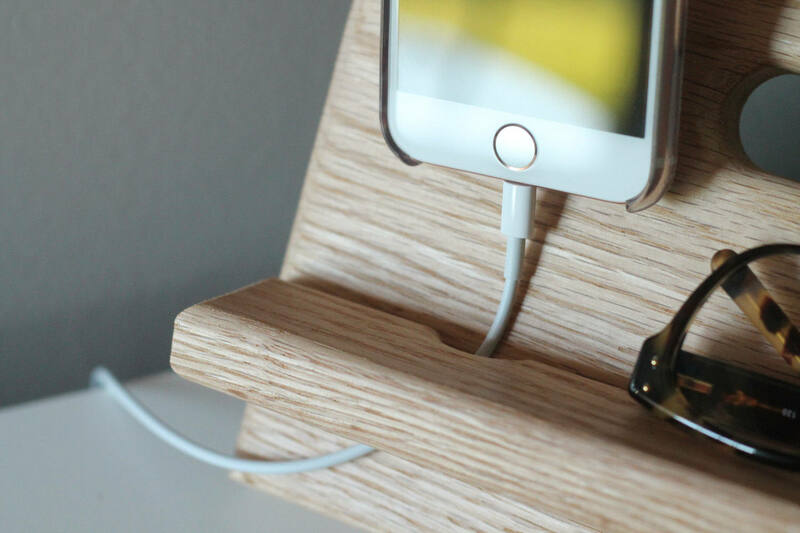 This docking stand will hold your phones- (pictured iPhone 5s) the bottom piece is built to allow a charging cable to come up underneath to be plugged into the bottom of your phone. (See Pictures) This will accommodate any phone that charges from the bottom, and this valet is designed to accommodate all phones- if your phone doesn’t charge from the bottom, you can still charge it from the side, or from the bottom and lay your phone on its side. An iPhone 6+ and the Droid equivalent will fit on here, but will stick up above the wood slightly. This valet is made with solid oak. We would never use cheap plywood in our construction. Solid oak that can be stained with several finishing options. All these options require polyurethane protection after staining. We include this protection in the price if you purchase stain. See our other listings for a version to charge your Apple watch on, hold a wallet, hold less bracelets/watches, or desktop versions. 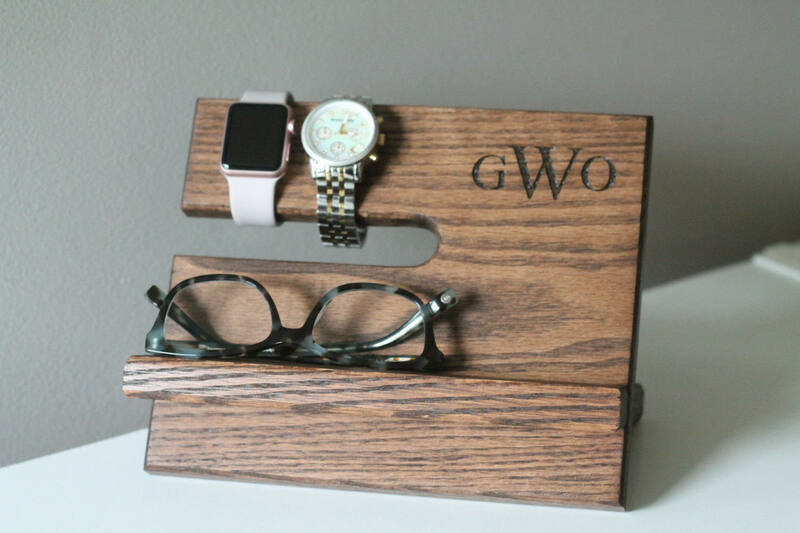 This watch stand can be found with the following link. Every listing we have has a dedicated shipping window. This is usually displayed on the Etsy page under “Shipping and Policies” section for each listing. This changes throughout the year depending on demand, but is always updated on our page. If you need last-minute gifts, we do offer “Same Day Shipping” items for purchase. This last-minute gift for him or her cannot be customized in any way because they are finished products, ready to ship. But, they do offer a last-minute solution to your gift needs. Examples of one of those listings are available below, but also available in the shop section “Same Day Ship”. Also, be advised, if you are outside of the US, shipping windows are consistent, delivery windows are not. 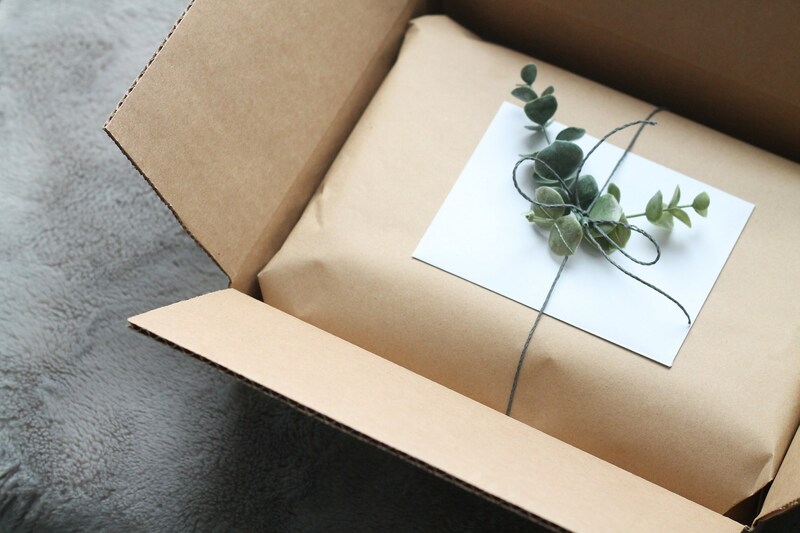 Depending on the customs processes between our two countries, it could add additional days, and/or months to the shipping times. Please see Etsy estimates for your specific time. One such example is below.